Generous amounts of ginger, garlic and soya sauce make this Indian Chinese invention an all time favourite. What's in our Chinese Manchurian ? 1. To make the Manchurian Balls: Mix 2 cups of your favourite grated vegetables like cabbage and carrot with ½ cup of flour/ maida and water in a pakora style batter. Shape into balls and deep fry like pakoras. 2. To make the Manchurian sauce: Stir-fry 2 cups of chopped vegetables(onion, capsicum, spring onion) until they are cooked, but still crunchy. 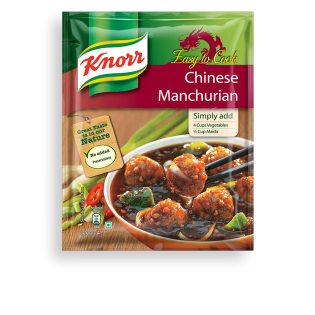 Ina separate bowl, mix the contents of Knorr® Easy to Cook Chinese Manchurian with 450 ml of water. Add this mixture to the vegetables and simmer until the sauce has thickened. 3. Add manchurian balls to the prepared sauce and cook for 1 minute. Garnish and serve hot!